War Thunder’s professional eSports league, Thunder League, kicked off in December with an interesting prize pool structure. Today, Gaijin Entertainment announced the tournament has reached its playoff stage with just eight teams remaining and over 40K in the bank. 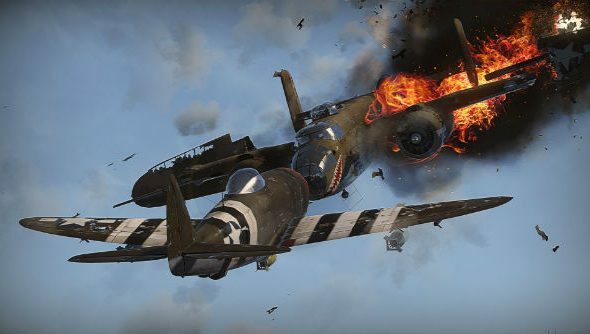 War Thunder is free-to-play and features on our list of best free PC games. The first season of Thunder League started out with a professional championship that gathered ten teams from Russia, Europe and the United States. Integral to the tourney’s structure is Dog Tags – items that influence the prize fund when purchased by players. A quarter of the money raised by the tags is slung into the overall prize pot and each time the prize pool hits a predetermined stage – $10,000, $15,000, and so on – players unlock opportunities to win prizes, such as team camouflages and vehicles. The eight teams left – four from Russia, one from Europe, one from Poland, one from Belorussia, and one from Ukraine – will compete in tank and aircraft battles, as well as a “special game” mode exclusive to the league. At the time of writing the prize pot contains $42,951. “The next stage will provide fans with a Panther T-V and Messerschmitt BF 109-E7/U2,” reads a statement put out by Gaijin today. “During the championship all War Thunder players can also join special E-100 tournaments, unlocked on one of the previous stages. The best players of the tournament will get one of the rarest tanks in the game – the super heavy German E-100. If you’d like to get involved, head over to the Thunder League site.